WHO: Colorado College Tigers (5-3) at Miami University RedHawks (3-3). COLORADO COLLEGE RADIO: KRDO-AM (1240), KRDO-FM (105.5), Colorado Springs, Colo.
NOTES: Remember that Colorado College team that the NCHC beat up the first few years of the league’s existence? You know, the team that the media kept saying was going to get better one of these days but has finished dead last in the league three of the first four seasons ? Well, that day has arrived. And what’s scarier: Not a single CC player that has logged a game this fall is a senior. The Tigers are just outside the USCHO’s top 20, having split in Vermont, swept Alaska-Anchorage, taken 1 of 2 at then-No. 17 New Hampshire and went 1-1 vs. North Dakota. That’s not a doormat’s resume. Colorado College has only outscored opponents by one goal, but the Tigers are 4-0 in one-goal games. So the Tigers are finding a way to win the tight games, an area in which Miami has improved so far this season. Nick Halloran leads the conference in points (4-8-12), and Mason Bergh is tied for first in the NCAA in goals (7) and is tied with Gordie Green for second in the league with 11 points. But this CC team hasn’t been particularly deep, as that duo has scored 46 percent of the team’s goals. Tyler Gooch is the only other Colorado College player with two goals – 11 others have one. Among Tigers forwards, Trey Bradley has a goal and seven assists and Westin Michaud has scored once and picked up five helpers. Colorado College has not gotten much offensive production from its defense. As a team, the Tigers have just two goals and seven assists from their blueliners. CC has not been great on special teams, converting power plays at an NCHC-worst 12.5 percent clip and killing just 74.3 percent of man-advantage opportunities. The RedHawks are second in the NCAA on the power play at 34.3 percent and are tied for the Division I lead with 12 PPGs. Defenseman Grant Hutton has five of those for Miami, tops in college hockey. However, the Tigers have been excellent at drawing penalties, as they have been on the power play 48 times already. Colorado College and North Dakota played each other last weekend in the first conference contests of the season. This weekend every NCHC team except UND will compete against league opponents. With the Tigers rejuvenated, this conference gets that much tougher. The PairWise has the Tigers at 13 and Miami at 49. Except for Cornell, every one of the RedHawks’ remaining opponents is ranked in the top 25. 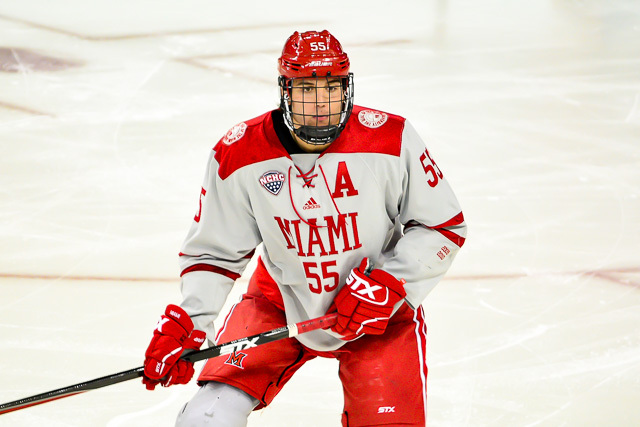 Posted on November 2, 2017, in 2017-18 and tagged 2017-18 miami redhawks, Colorado College Tigers, grant hutton, miami redhawks preview, NCHC. Bookmark the permalink. Leave a comment.